UW-Madison researchers have created a new electronic switching-friendly material to aid in the development of ultrafast electronic devices. According to professor Chang-Beom Eom, the material can easily transition from an electricity-transmitting metal to a nonconducting insulating material. “This is quite an exciting discovery,” says Eom, referring to the material’s ability to transition without changing its atomic structure. Metals like copper or silver conduct electricity, while insulators like rubber or glass do not allow current to flow. There are some materials that can transition from insulating to conducting and back again. But this means that the arrangement of a material’s atoms and its conducting electrons must change in a coordinated way. Most of the time, the atomic transition typically proceeds much more slowly than the smaller, lighter electrons that conduct electricity. For their study, Eom and his team used a material called vanadium dioxide – which is a metal when it’s heated and an insulator when it’s at room temperature. At high temperatures, the atoms that make up vanadium dioxide are arranged in a regularly repeating pattern that scientists refer to as the rutile phase. When vanadium dioxide cools down to become an insulator, its atoms adopt a different pattern, called monoclinic. Vanadium dioxide transitions between a metal and an insulator at different temperatures depending upon the amount of oxygen present in the material. 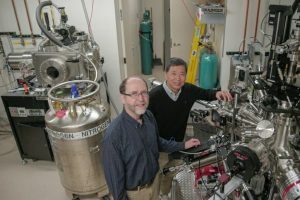 The researchers leveraged this fact to create two thin layers of vanadium dioxide – one with a slightly lower transition temperature than the other – sandwiched on top of each other, with a sharp interface between. When they heated the thin vanadium dioxide sandwich, one layer made the structural switch to become a metal. Atoms in the other layer remained locked into the insulating monoclinic phase. Surprisingly it was that part of the material that conducted electricity. An added plus was that the material remained stable and retained its unique characteristics.